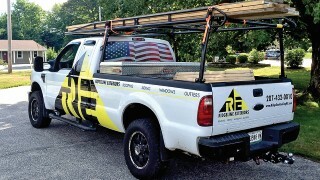 Ridgeline Exteriors owner Wayne Perry has been putting roofs on homes since he was 15 years old. As a second generation contractor his company can help keep water and ice from ruining a home. Their focus is on roofing, but they are also versed in siding, windows and gutters. “Because of the warranty, Owens Corning is our favorite to use,” Perry said. The company works with mostly homeowners and some small commercial companies in York and Cumberland counties in Maine and Rockingham and Strafford counties in New Hampshire. The businesses is headquartered in Sanford and is considering expanding into Windham next year. Perry got his start in roofing because it paid better than the other summer jobs his friends were doing. “It was more hard work,” he said, but it was good for his body and he was bringing home double what his friends were. “All of our work and our workmanship is all backed by Owens Corning. 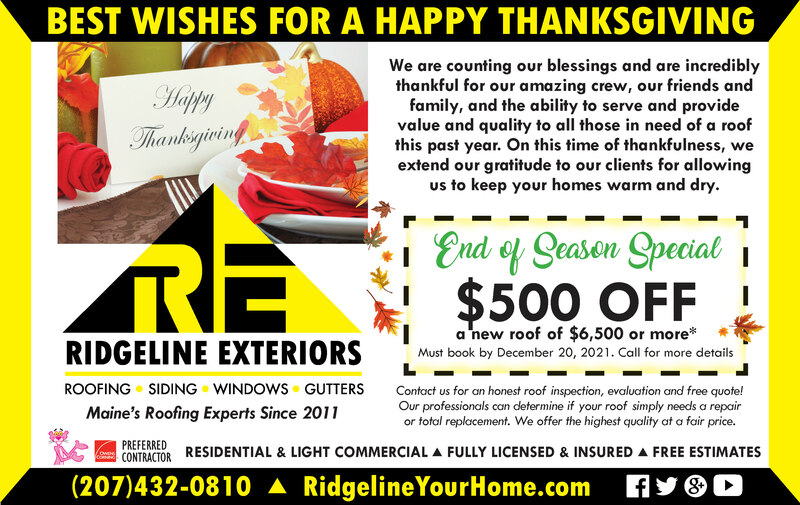 They back us and check everything to make sure it’s done to their satisfaction.” Even if Ridgeline Exteriors was no longer doing roofs, the warranty would still be in effect. Each of the 10 employees of Ridgeline Exteriors has been in-house trained by Perry. Jason Gilpatrick is the foreman. Perry trusts him and knows that when he leaves Gilpatrick in charge the job is being done to Perry’s satisfaction. Roofing is a dangerous, physically demanding job. Having a professional do the work keeps the homeowner safe. “To some people it’s just a roof. If you don’t have a roof, everything inside is junk,” Perry said. Roofs should be inspected every five years for damage or issues with the shingles. They are intended to last for 50 years, but in Maine the weather changes all the time. Weather extremes from hot summers to very cold winters, wind and everything else Mother Nature throws at Maine can hurt a roof. The work has to be done according to code. You can’t cut corner on it, Perry said. Ridgeline Exteriors is fully insured, holds general liability insurance and has a A+ rating through the Better Business Bureau. They have seven trucks and any tools they might need for a job. Most jobs are complete in a day or a day in a half. Perry is a certified recycling contractor, meaning that the shingles he removes get ground up and turned into roads. Ridgeline Exteriors has been in business for 12 years. “Eat, sleep, roof, that’s what it really is,” Perry said. “Once you’re a roofer, you’re always a roofer.” The business is exciting because every day the job is some place different and there are different challenges to work on. One day the company could be on Long Island or Peaks Island then the next day the workers have a view of Mount Washington. He’s had to have his trucks and equipment ferried out to Frye Island and is very accommodating in all situations. Ridgeline Exteriors offers free estimates and inspections. They also do metal roofing in addition to the shingles. The work can be done year round. A new roof on an everyday cape, colonial or ranch will run approximately $5,000 to $7,000. Any customer who books a roof project this fall will be charged only $3.25 per square foot. Get in on the deal now. For more information or to book an inspection, call Wayne at 207-432-0810, email him at wayne1822@gmail.com and visit them online at www.ridgelineroofingme.com.